As part of their 50th anniversary celebration, the German cci Dialog publishing house awarded for the first time a prize for trustworthiness in the ventilation, air conditioning and refrigeration industry. The glittering award ceremony took place on 22 June 2017 in Karlsruhe, southern Germany. 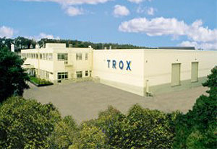 TROX had entered the competition in four categories and won in three.